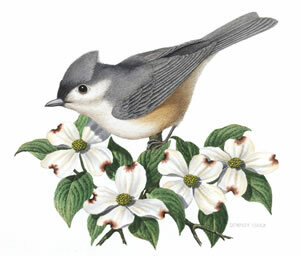 "Studio Friends: A Pair of Prints"
Colored an almost textured pearl gray and white, the Tufted Titmouse is a small bird with a big voice. If one partakes of the sunflower seeds in your window feeder you can hear their "CLEAR, CLEAR, CLEAR" call throughout your house and yard. 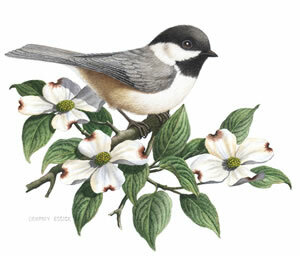 They are cousins of the Carolina Chickadee. Where you see one you'll usually see the other. They are like Mother Nature's decoration for your yard. Titled so because of the company they provide Dempsey during his long hours of painting, "Studio Friends" each contain a hidden hummingbird image.